The use of stun guns by police significantly increases the chances of citizen injury, yet also protects the officers more than other restraint methods, according to the most comprehensive research to date into the safety of stun guns in a law enforcement setting. William Terrill, lead researcher on the project and Michigan State University criminologist, said the federally funded research presents a dilemma for police agencies weighing use of the controversial weapon. Nationally, some 260,000 electronic control devices, or stun guns, are in use in 11,500 law enforcement agencies. A Michigan State University release reports that stun guns deliver a painful and immobilizing electrical shock through two prongs that are pressed directly against the suspect or through two barb-tipped wires shot from the weapon. The majority of previous research generally has found stun guns to be non-harmful to those on the receiving end. Terrill said some previous studies have been anecdotal or misleading. After a stun gun incident, the officer notes on his report whether the suspect was injured. Yet some researchers, for the purposes of their studies, changed the officer’s ruling if they considered the injury minor — such as a laceration or a burn from the stun gun – which effectively “changes the rules” of objective research, Terrill said. Through the MSU-led research, funded by the National Institute of Justice, the criminologists studied stun gun incidents in a sampling of mid-sized to large U.S. cities over a period of nearly four years. The researchers spent a month in each of the cities, which include Columbus, Ohio, Portland, Oregon, and Knoxville, Tennessee. 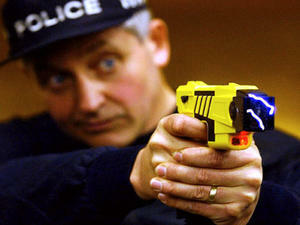 All police departments in the study used the Taser gun made by Arizona-based Taser International. In the first study, which appears in the current print issue of Justice Quarterly, the researchers found citizens were injured 41 percent of the time when officers used a stun gun only during apprehension. By contrast, citizens were injured only 29 percent of the time when no stun gun was used (when stun guns were used with another restraint method, such as pepper spray or wresting the suspect to the ground, citizens were injured 47 percent of the time). The study looked at 13,913 use-of-force cases in seven cities. The researchers took into account a host of factors, including the amount of citizen resistance, influence of alcohol or drugs, and officer experience. Injuries ranged from cuts to broken bones. In the second study, online now in Police Quarterly, the researchers found officers were injured 5 percent of the time when using a stun gun only. By contrast, officers were injured nearly 10 percent of the time when no stun gun was used. The study looked at 12,455 use-of-force cases in six cities. Terrill said the most important factor in use-of-force cases is the officer’s safety. At the same time, he said stun guns may not be the “panacea” as many believe. “There has been this increased perception that these devices are effective and safe,” Terrill said. “But in terms of safeness, our data conclusively shows they are not safe to citizens. Now, are there concerns to the point that we’re recommending that law enforcement agencies not use them? The next step is determining how effective stun guns are in subduing a suspect, something Terrill and colleagues are analyzing. Terrill’s fellow researchers are Eugene Paoline from the University of Central Florida and Jason Ingram of Illinois State University.